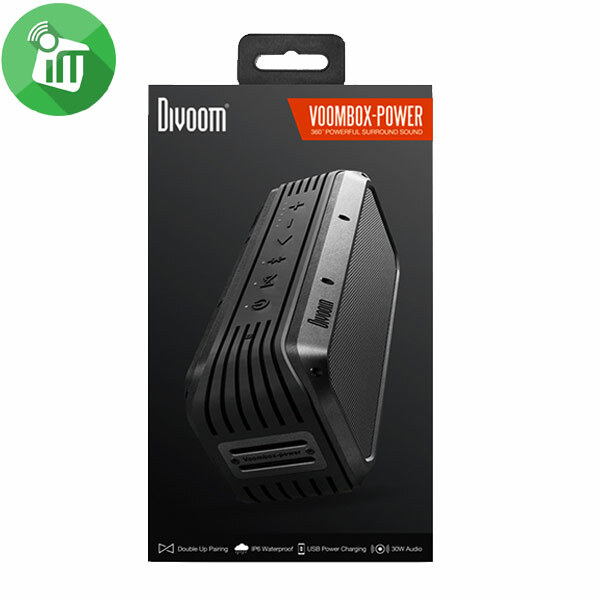 Divoom TimeBox-Mini is the most unique desktop companion with the versatile functions up in its sleeves. 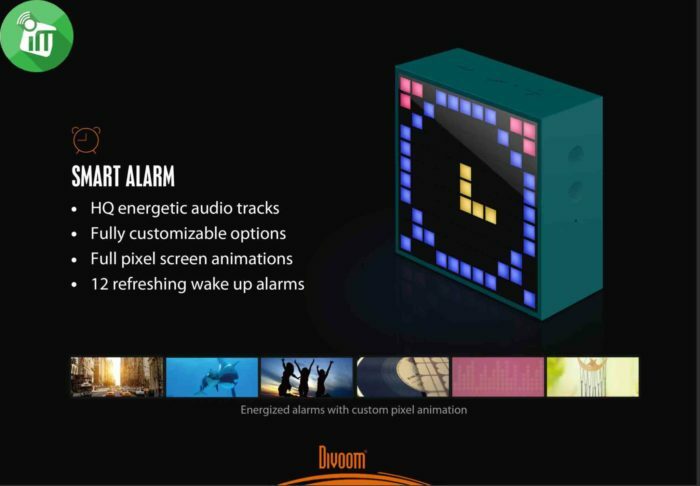 It’s a fine-tuned Bluetooth speaker, a pixel art canvas, a smart alarm, a LED lamp, also a powerful computing device. 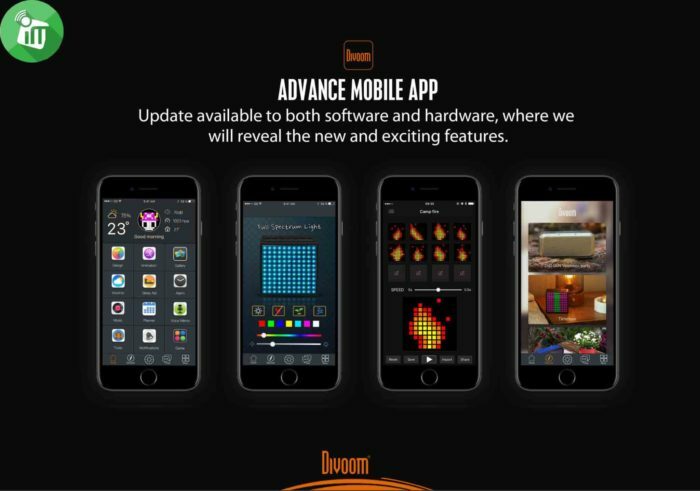 It will continue to evolve through the software updates, where it brings excitement and fun into your daily life. 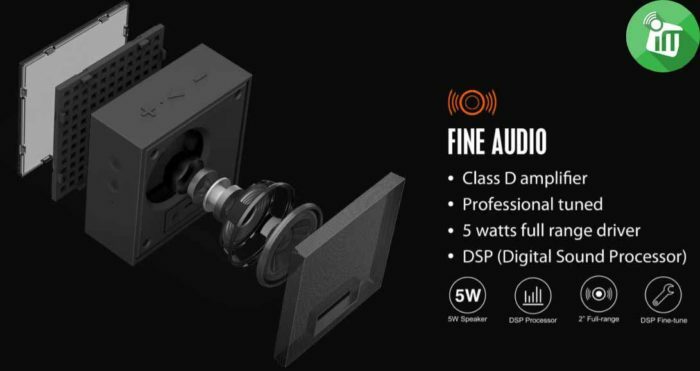 Equipped with a compact 5W full-range driver,our acoustic engineers fine-tuned the Timebox Mini audio with the latest DSP(Digital Sound Processing) technology. 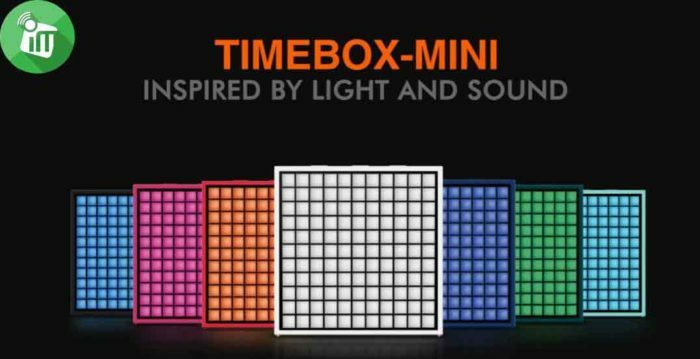 With a panel of 11×11 RGB LED, Timebox Mini delivers the most vibrant colors, and we also fitted it with the smaller LED. While consuming less energy, these smaller LED provides the almost equivalent luminosity as a 3W night light, and your pixel art now appear more vivid and detailed. 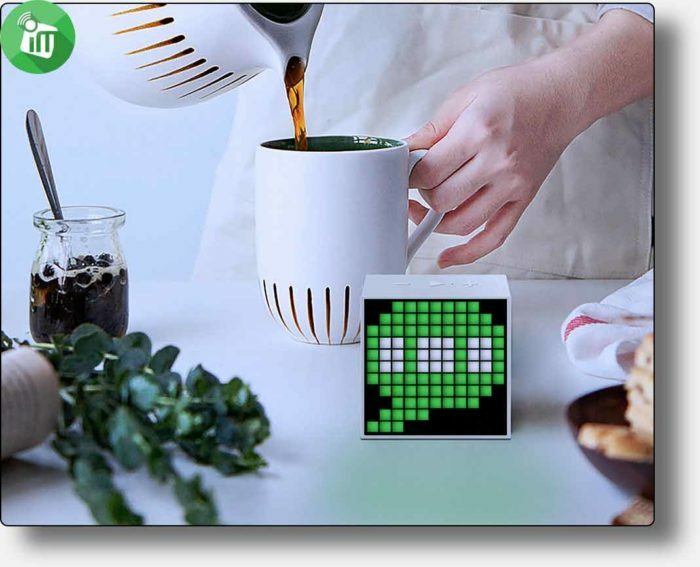 Creating pixel art has never been easier! You can create your awesome design within seconds. 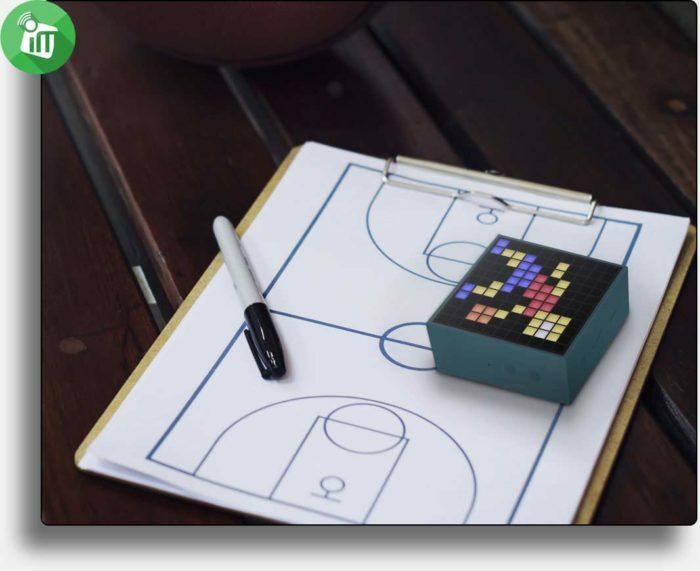 Doodle or Picasso, just unleash your creativity in the most convenient and modern way. 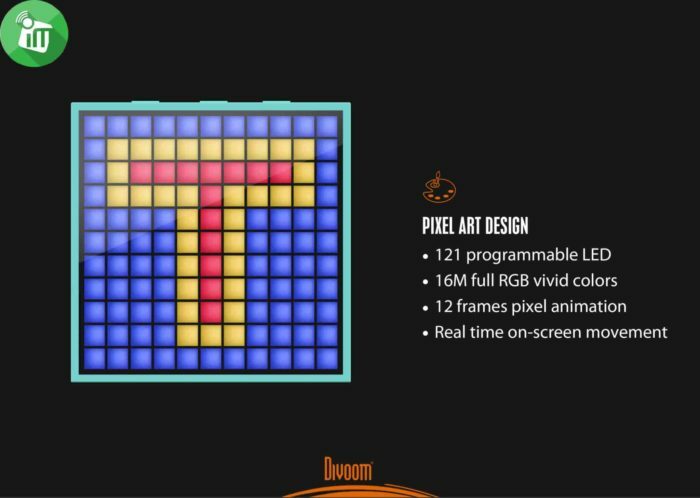 While you need creativity to make the pixel art, you also need the logic skill to chain theframes togetherinto an awesome animation. This is exactly how the cartoon¡¯s made, and it¡¯s only logical. 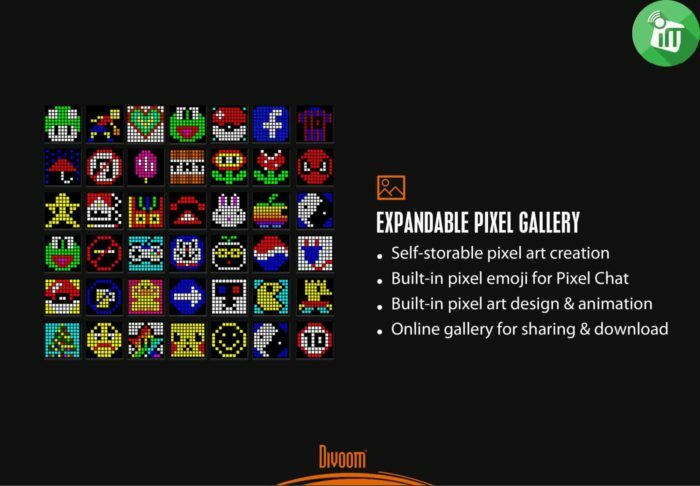 As a true fan of pixel art, share your awesome designs with the rest of the world, where others can download your inspiring works. 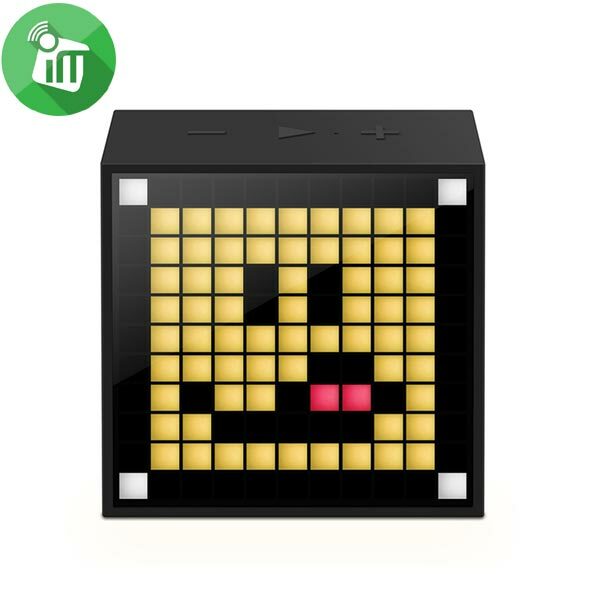 Following the rhythms of your music, the Timebox Mini lights will dance to the beats. We also have some great lighting effects, where you can further enhance your audio experience with the vibrant patterns. Everyone¡¯s a DJ with the Timebox-Mini. 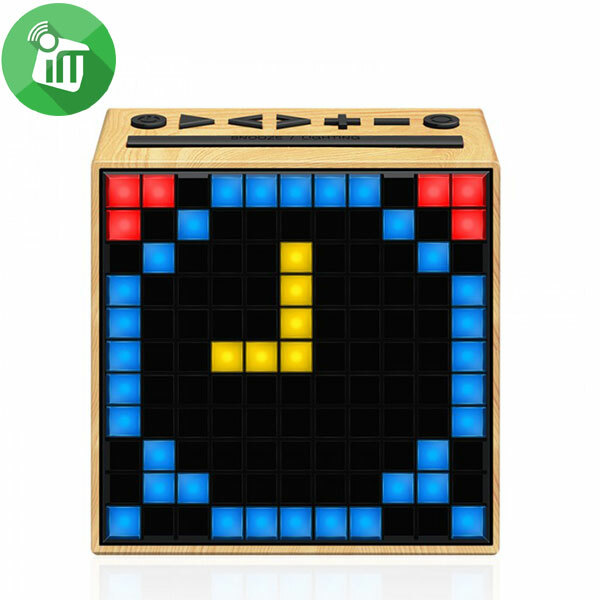 Play your favorite beat,and start jamming with the built-in sound effects. 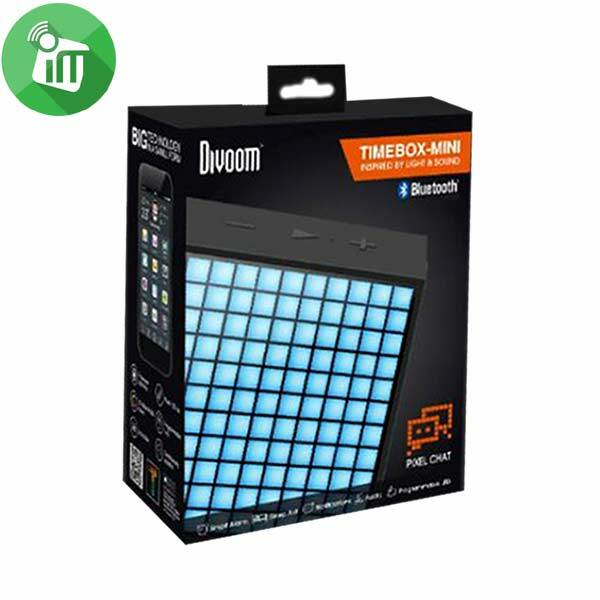 The Timebox Mini has the similar luminosity as a 3W night light, where you can select the perfect lighting that suit your mood. Pick the color and brightness, play the favorite beat; the night is young. 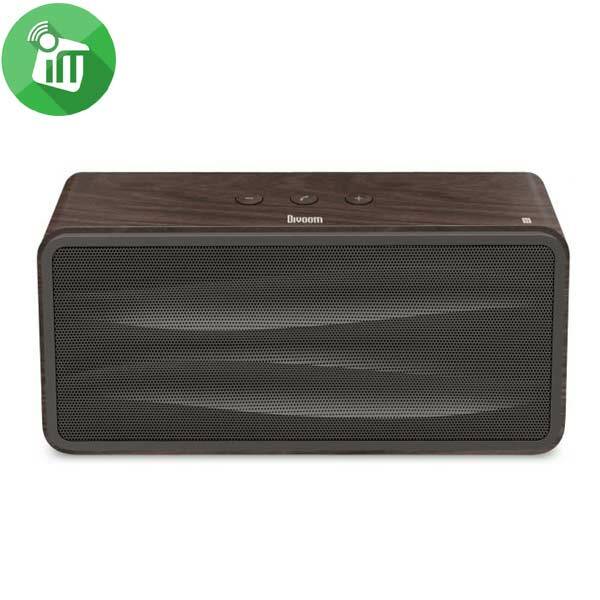 With both visual and audio stimulation, Timebox-Mini included 22 professional sleep-aid tracks that help you fall asleep faster. 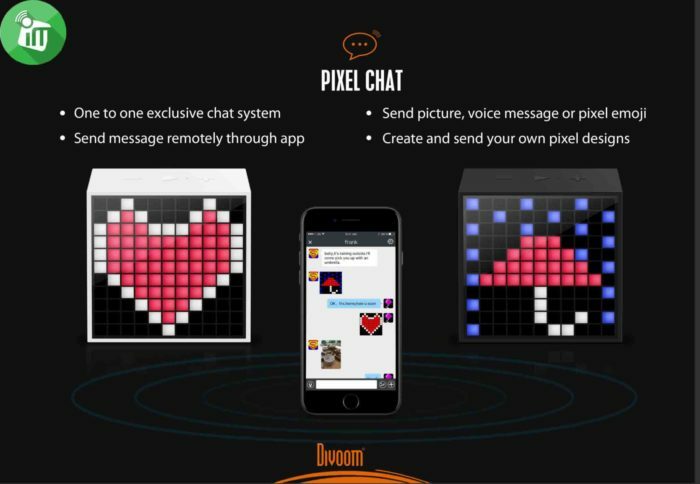 Unique chat system that only available between you and your invited buddy,where you can surprise him/her with a pixel. 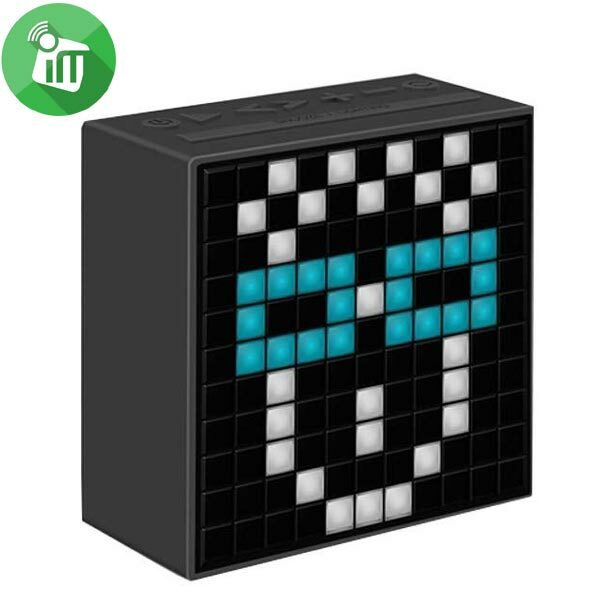 design displayed on the Timebox Mini.You can send a pixel emoji/pixel design regardless your location; it will ¡®magically¡¯appear on his/her Timebox Mini. Online weather report for your area, Timebox Mini is your little weather reporter on the clock.Weather report based on your GPS location. 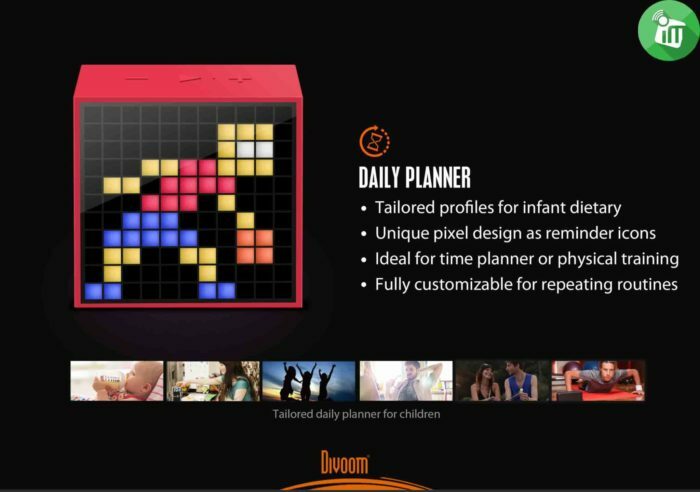 Studying for a final, working out at home, or keeping track of a baby¡¯s dietary schedule; you can add/customize the planner on the Timebox Mini to better assist you. Leave a voice message on the Timebox Mini, it’s your personal reminder or a ¡®fridge notepad¡ for your family. Both TimeBox -MINI and its mobile application will continue to evolve through the updates, where we will implement the suggested updates and tweaks by you. ♦ Improve the time management by setting reminder for the important daily routines. 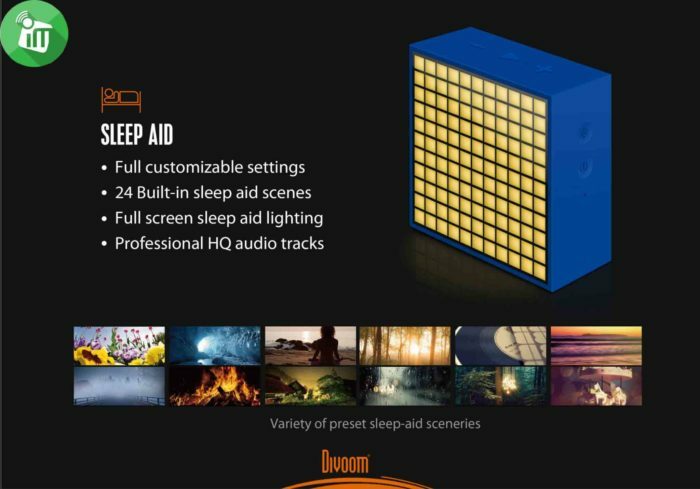 ♦ Over 30 preset sleep-aid programs for the best sleep experience, and always feel energetic when you wake up. 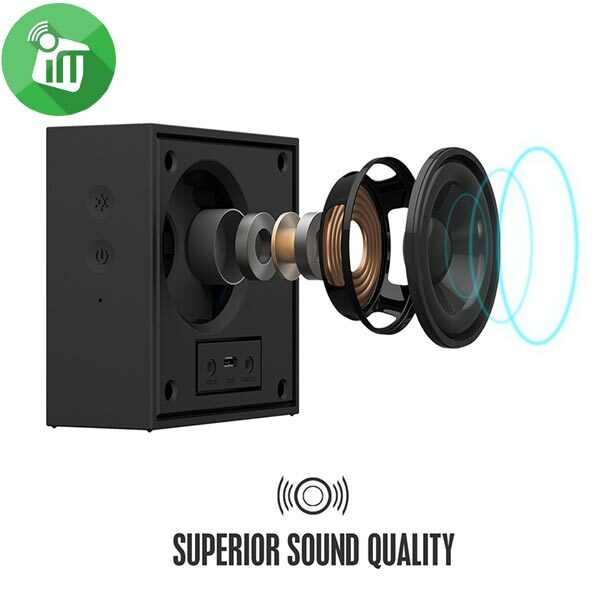 ♦ Enjoy the world-class audio through the fine-tuned speaker, and the built-in MIC and advance notification system. 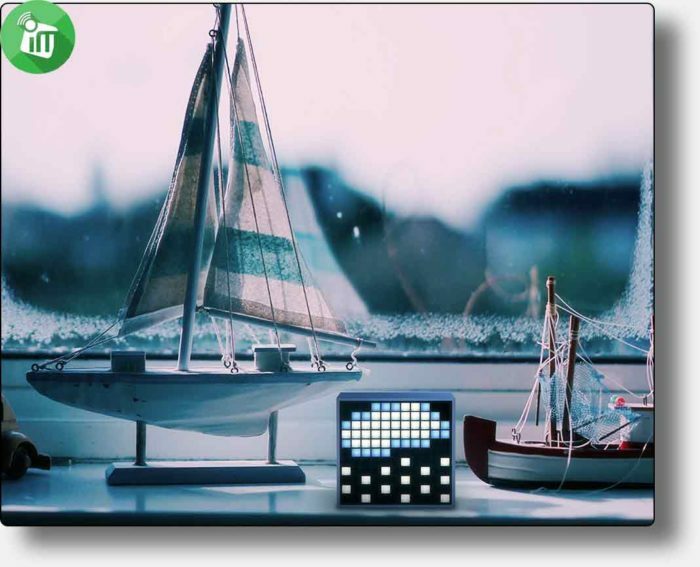 ♦ Compact design for your office desktop, it’s a digital clock and more. Press the Handsfree button to pick up an incoming call. ♦ Please connect the 3.5mm Auxiliary cable(provided)between the multiple TimeBox Timebox Aux-in port and the music source device. ♦ You can daisy-chain does not AUX mode)together via their Aux out and Aux-in ports. ♦ The daisy-chain function support the Bluetooth connection. 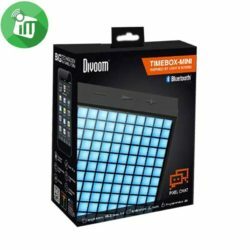 How to record a voice message on the TimeBox-Mini? 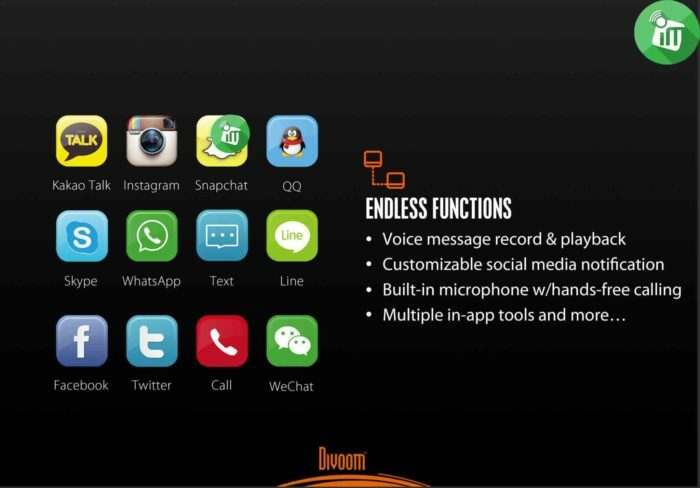 You can record a voice message via the following methods: a Using the Divoom app, please select Voice Memo and start recording b Hold the play button until the record icon appear, then press the same button again to finish recording Once a voice message is recorded, a message icon will appear on the TimeBox-mini screen, and can press button to playback the recorded message. The message will remain until it has been played. Once played, the message will be deleted automatically. 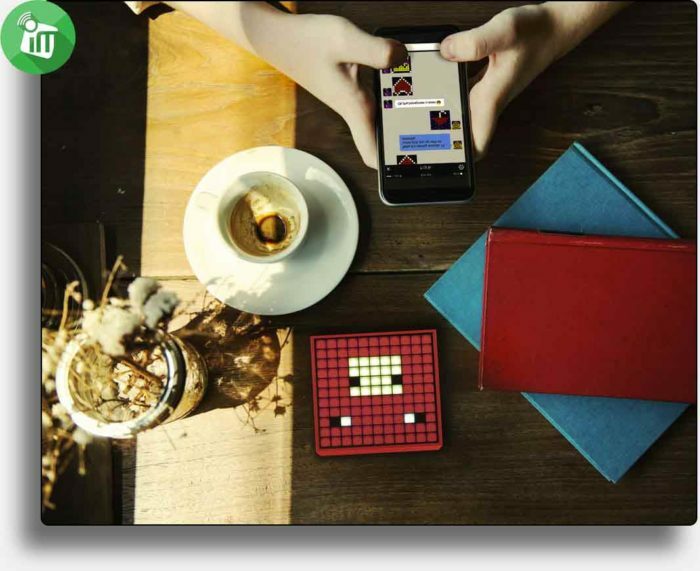 3 – Search and pair the TimeBox-Mini on the new mobile Device. 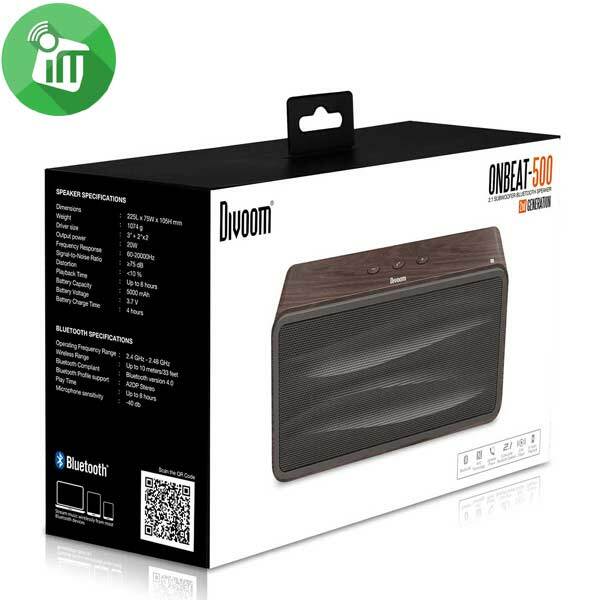 Stream all your digital media from iPhone, iPad or any other Bluetooth devices. 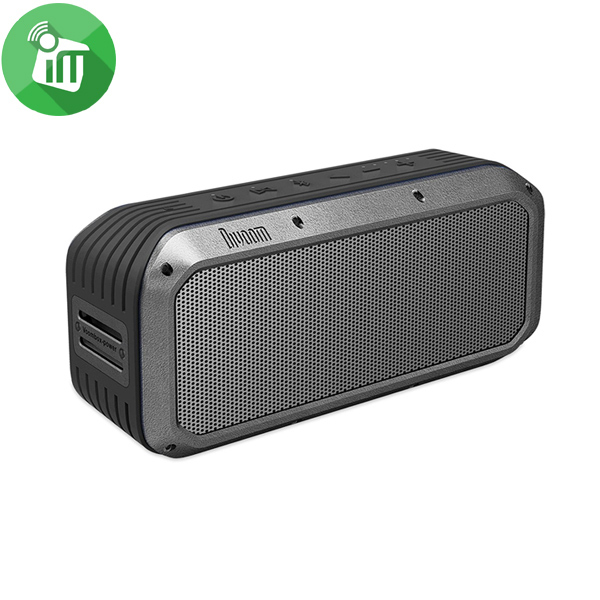 Rechargeable polymer li-ion battery provides up to 8 hours of non-stop music.